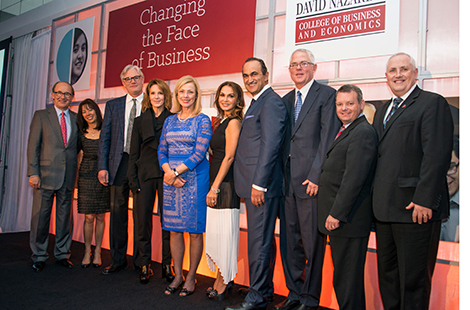 CSUN President Dianne F. Harrison and visionary businessman and CSUN alumnus David Nazarian have announced an additional $6 million in gifts toward a $25 million fundraising campaign, launched this past spring with Nazarian’s personal gift of $10 million to support his alma mater and the David Nazarian College of Business and Economics. Read more about the campaign. Mamiko Yamai came to the United States with minimal English-speaking skills, a passion for figure skating and a strong motivation to expand her horizons in dance and language. Read more about Yamai. The longtime political leader shared stories and offered information on sustainability from more than five decades in public service and environmental activism during a talk at CSUN. Read more about Hayden. Fri., Nov. 28, 5 p.m. Tue., Dec. 2, 7 p.m. Thu., Dec. 4. 7:30 p.m.
For Your Information this week features the China Institute Lecture Series, Campus Pet Food Drive and information about the new acting Faculty President. Campus leaders come together to discuss how their favorite books influenced their leadership skills. The University Corporation offers a Friday lunch special for faculty and staff at Geronimo’s, located at the satellite student union. The special is available from 11 a.m. to 2:30 p.m. Dec. 5 and 12.